Generation Y, digital natives, are not as fundamentally different from other employees, as some people would have you believe. Where they differ is in their expectations of what an employer should do, what their psychological contract looks like and how they want to progress in their careers. They are strongly influenced by their peers in their choice of employer and even before they join, may impact a company’s reputation. When looking to recruit, retain and develop Generation Y talent, companies must be acutely aware of these factors that influence the youngest generation in the workplace. Is Generation Y really different? Haven’t young people in the workplace always been the same? They are enthusiastic, full of energy, ambitious, risk-taking and believe they have bright ideas that will translate into major improvements. So what is different about today’s under-30s? 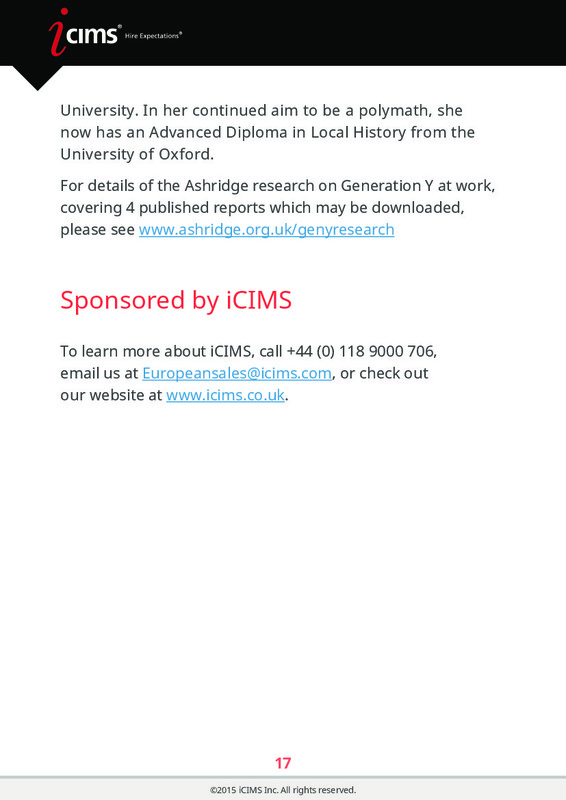 Research at Ashridge Business School over the last 8 years has shown that there has been a fundamental shift with this generation. They come into the workplace with the same raw potential as their colleagues from previous generations, but with different experience and expectations. What sets this generation apart is that it communicates differently and therefore needs to be approached differently. It is the background environment that has impacted Gen Y far more than past generations. That environment can be divided into upbringing – family and education; communication – peers and media; technology; and the wider social background – society norms, culture and world events. 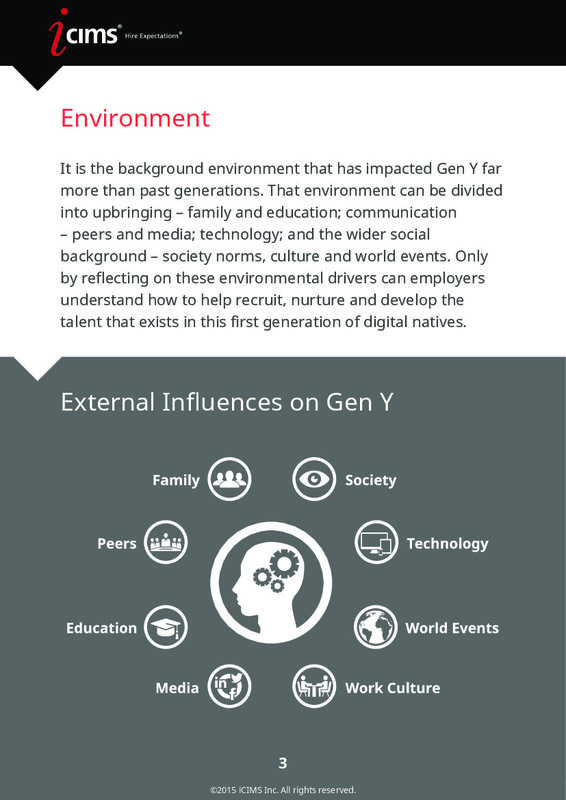 Only by reflecting on these environmental drivers can employers understand how to help recruit, nurture and develop the talent that exists in this first generation of digital natives. The widely claimed 'entitlement rights' demanded by this generation are driven by its upbringing. Gen Y, with fewer siblings, in a world perceived to be more dangerous, has been nurtured by protective and ambitious parents and supported by an education system which praises more highly and universally than in the past. Consequently the youngest generation in the workplace has a different outlook on both life and work. The workplace psychological contract is shifting. Members of Gen Y have a high sense of self-worth and have been encouraged to speak their minds. Exploiting technology, they communicate frequently with a wide audience, often anonymously, which heightens the sense of having a significant voice with little or no comeback. Through their large networks of contacts and ‘friends’, some of whom they have never met, they have a heightened understanding of the world compared to their predecessors. They seek frequent and visible praise and are keen on qualifications and public acknowledgment that can prove their worth, so they can stand out from the crowd. Where Gen Y struggles, after a lifetime ‘growing up in my bedroom’, is in face-to-face communication skills and emotional intelligence. They are less conscious of the impact they have on others and how they are perceived. They may struggle with competitive situations at work and on making decisions based on analysis of risk. Some have less resilience to cope with setbacks and project failures. Now that the older members of this generation are moving into management positions they find they struggle with difficult conversations – on poor performance for example, and on negotiating through office politics or conflict situations. Therefore it is not surprising that differing perspectives on the work environment cause tension between generations and have HR staff scratching their heads in puzzlement. However, Gen Y is keen to progress. It is a case of firstly, recruiting those members of Gen Y that best fit the organisational culture and have the potential to succeed, then helping young people to grow and develop. 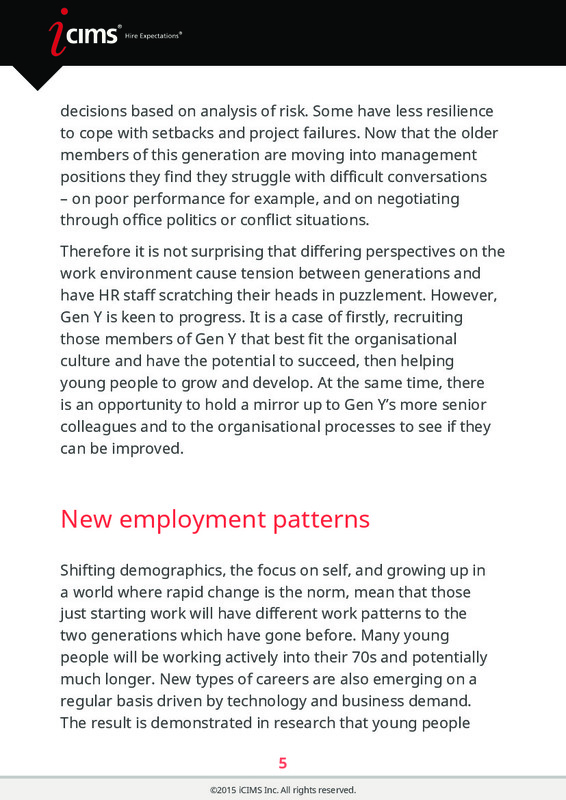 At the same time, there is an opportunity to hold a mirror up to Gen Y’s more senior colleagues and to the organisational processes to see if they can be improved. Shifting demographics, the focus on self, and growing up in a world where rapid change is the norm, mean that those just starting work will have different work patterns to the two generations which have gone before. Many young people will be working actively into their 70s and potentially much longer. New types of careers are also emerging on a regular basis driven by technology and business demand. The result is demonstrated in research that young people do not want to ‘settle down’ into work until they are about 30. As few as 30% of recent graduates may still be in their current job after 2 years. They want to experiment with different roles, companies and working situations and may even have extended work breaks during this decade. They are not looking long-term in their twenties. This is the decade of experimentation. And why not? There may be another 50 years of work ahead. What does this mean for agencies and employers when they are looking to recruit? Graduates’ intention to stay – from today to ten years out, for UK, Middle East, India & Malaysia. Ashridge research conducted in 2012-14 with about 3000 people. 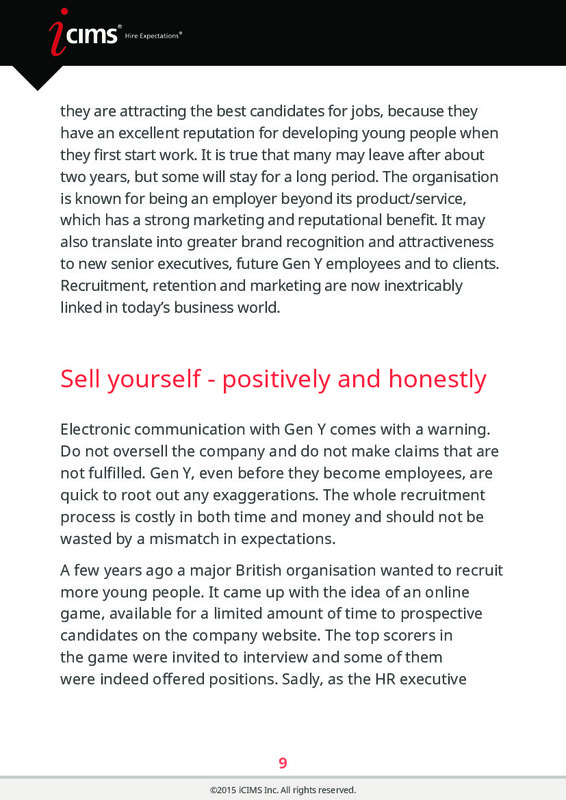 First of all, given that Gen Y is an ‘instant reaction’ generation, it is important to be attractive as an employer. 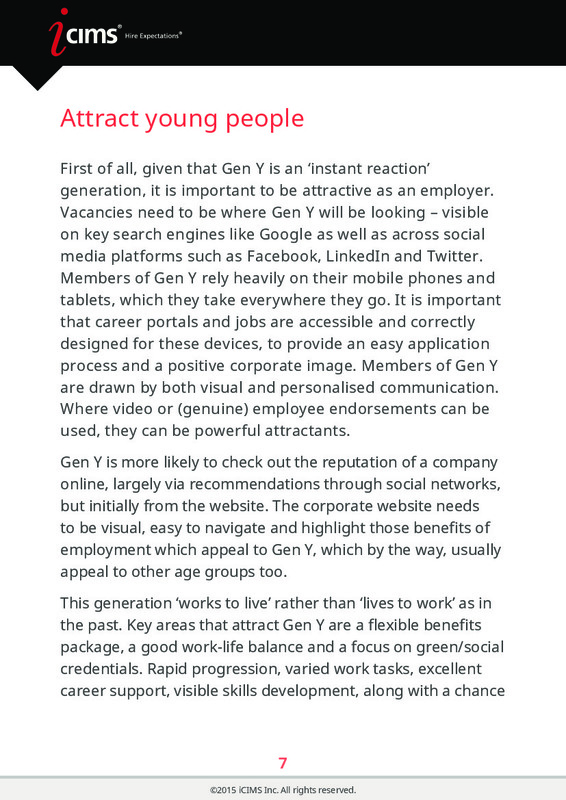 Vacancies need to be where Gen Y will be looking – visible on key search engines like Google as well as across social media platforms such as Facebook, LinkedIn and Twitter. Members of Gen Y rely heavily on their mobile phones and tablets, which they take everywhere they go. It is important that career portals and jobs are accessible and correctly designed for these devices, to provide an easy application process and a positive corporate image. Members of Gen Y are drawn by both visual and personalised communication. Where video or (genuine) employee endorsements can be used, they can be powerful attractants. Gen Y is more likely to check out the reputation of a company online, largely via recommendations through social networks, but initially from the website. The corporate website needs to be visual, easy to navigate and highlight those benefits of employment which appeal to Gen Y, which by the way, usually appeal to other age groups too. This generation ‘works to live’ rather than ‘lives to work’ as in the past. Key areas that attract Gen Y are a flexible benefits package, a good work-life balance and a focus on green/social credentials. Rapid progression, varied work tasks, excellent career support, visible skills development, along with a chance to influence direction are important to them. One critical element is in the area of ‘time’ – allowing different forms of sabbatical or time off work apart from standard holidays. In fact those employees nearing the end of their careers are also keen on these flexible time benefits. Social media is critical – where and how frequently does the organisation participate? How influential is it? What is being said about the company – good and bad? Young people are highly influenced by the social media reputation of an organisation. If this has not been an area of focus, it needs to be. 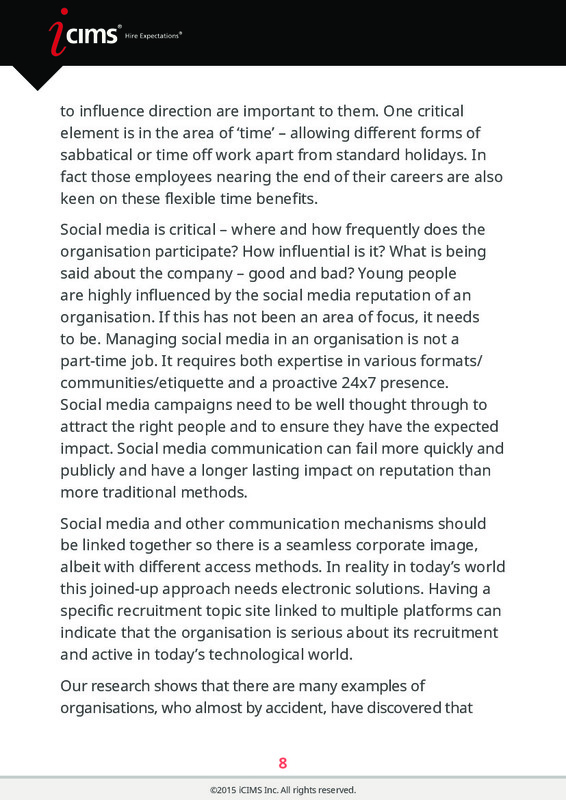 Managing social media in an organisation is not a part-time job. It requires both expertise in various formats/communities/etiquette and a proactive 24x7 presence. Social media campaigns need to be well thought through to attract the right people and to ensure they have the expected impact. Social media communication can fail more quickly and publicly and have a longer lasting impact on reputation than more traditional methods. Social media and other communication mechanisms should be linked together so there is a seamless corporate image, albeit with different access methods. In reality in today’s world this joined-up approach needs electronic solutions. Having a specific recruitment topic site linked to multiple platforms can indicate that the organisation is serious about its recruitment and active in today’s technological world. Our research shows that there are many examples of organisations, who almost by accident, have discovered that they are attracting the best candidates for jobs, because they have an excellent reputation for developing young people when they first start work. It is true that many may leave after about two years, but some will stay for a long period. The organisation is known for being an employer beyond its product/service, which has a strong marketing and reputational benefit. It may also translate into greater brand recognition and attractiveness to new senior executives, future Gen Y employees and to clients. Recruitment, retention and marketing are now inextricably linked in today’s business world. Electronic communication with Gen Y comes with a warning. Do not oversell the company and do not make claims that are not fulfilled. Gen Y, even before they become employees, are quick to root out any exaggerations. 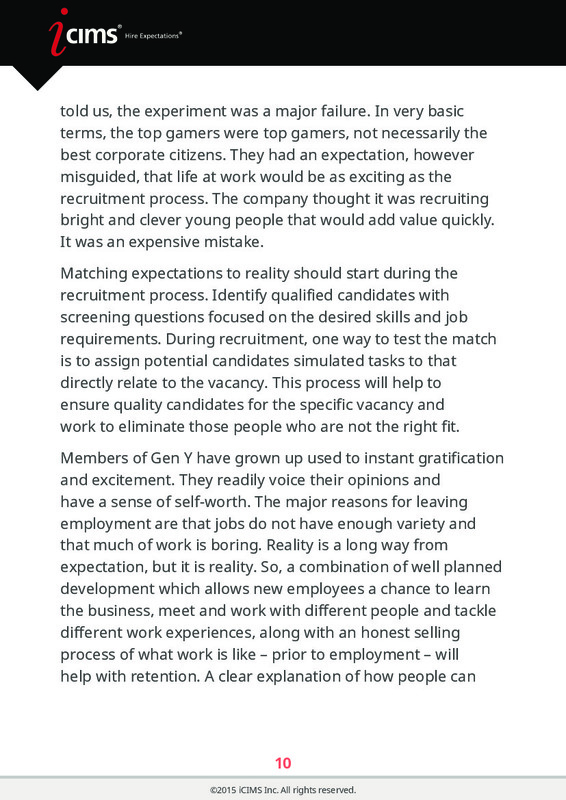 The whole recruitment process is costly in both time and money and should not be wasted by a mismatch in expectations. A few years ago a major British organisation wanted to recruit more young people. It came up with the idea of an online game, available for a limited amount of time to prospective candidates on the company website. The top scorers in the game were invited to interview and some of them were indeed offered positions. Sadly, as the HR executive told us, the experiment was a major failure. In very basic terms, the top gamers were top gamers, not necessarily the best corporate citizens. They had an expectation, however misguided, that life at work would be as exciting as the recruitment process. The company thought it was recruiting bright and clever young people that would add value quickly. It was an expensive mistake. Matching expectations to reality should start during the recruitment process. Identify qualified candidates with screening questions focused on the desired skills and job requirements. During recruitment, one way to test the match is to assign potential candidates simulated tasks to that directly relate to the vacancy. This process will help to ensure quality candidates for the specific vacancy and work to eliminate those people who are not the right fit. Members of Gen Y have grown up used to instant gratification and excitement. They readily voice their opinions and have a sense of self-worth. The major reasons for leaving employment are that jobs do not have enough variety and that much of work is boring. Reality is a long way from expectation, but it is reality. So, a combination of well planned development which allows new employees a chance to learn the business, meet and work with different people and tackle different work experiences, along with an honest selling process of what work is like – prior to employment – will help with retention. A clear explanation of how people can progress quickly and why they will be doing certain tasks, helps to improve both the onboarding process and retention. Good use should be made of existing Gen Y employees. Where appropriate, exit interviews should include discussion on what attracts and discourages this generation to the organisation. 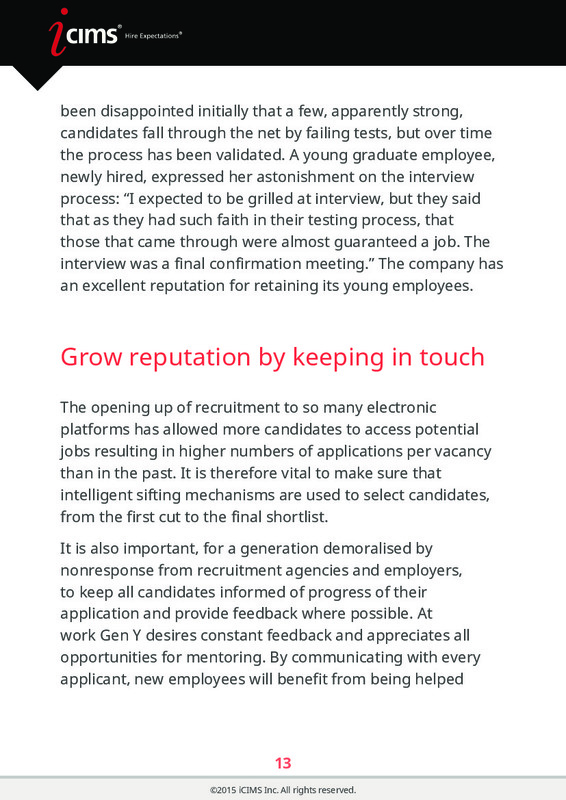 A series of interviews of existing Gen Y employees to solicit their feedback before a recruitment campaign is also valuable. It provides an opportunity to sell the campaign internally and encourage their help in using social media to describe their experiences about working in the organisation. Their honest opinions will be valued by prospective candidates, and may often provide incentive for the company to work on the ‘areas for improvement’ that have been mentioned. 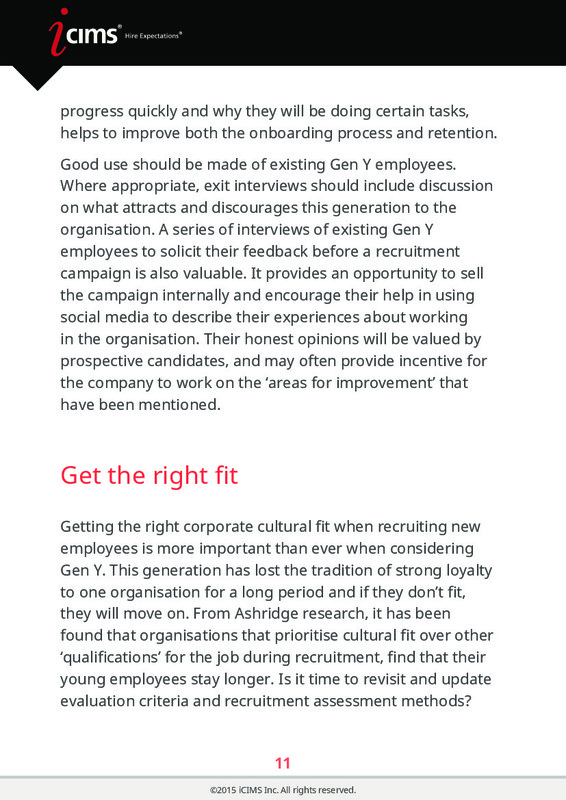 Getting the right corporate cultural fit when recruiting new employees is more important than ever when considering Gen Y. This generation has lost the tradition of strong loyalty to one organisation for a long period and if they don’t fit, they will move on. From Ashridge research, it has been found that organisations that prioritise cultural fit over other ‘qualifications’ for the job during recruitment, find that their young employees stay longer. Is it time to revisit and update evaluation criteria and recruitment assessment methods? 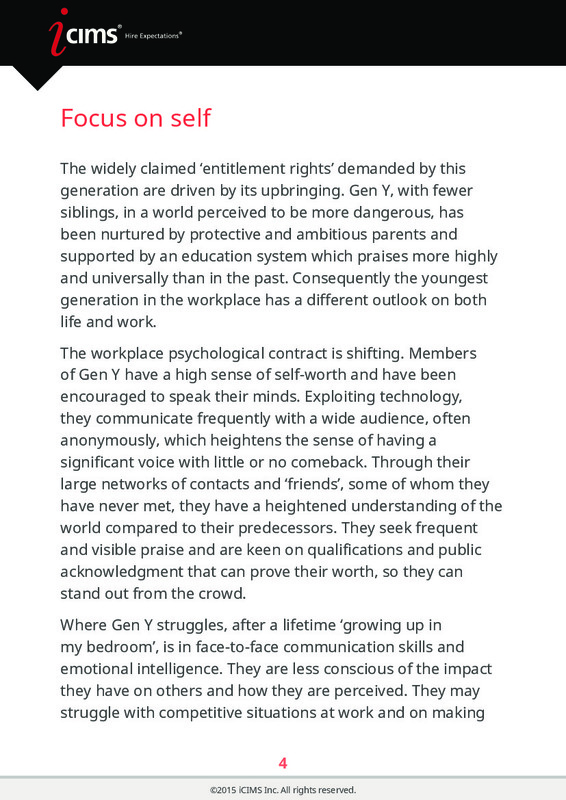 Knowing that Gen Y may struggle in certain areas, more so than previous generations, it is important to test and select for those characteristics that will allow them to fit in and thrive in their new organisation. Both psychometric (or other appropriate) tests and face-to-face assessment exercises help to highlight the best future employees. Tests for the cultural fit are critical, although some organisations struggle to articulate what that culture is and which behaviours they seek. What are the key elements of the culture that would be noticeable to outsiders? Which aspects of the culture are deeply embedded in the employees and important for success? How can you test and select recruits that will fit this culture? Other generic areas which should be used to test Gen Y include face-to-face people skills, communication in all forms, emotional intelligence, self-motivation and teamwork. As members of Gen Y are digital natives, they will be attracted by an opportunity to communicate their talents digitally. As a screening tool, try asking them to create a short video about themselves, showcasing their communications skills, professionalism and personality and use these submissions to help gauge their cultural fit for the organisation. Perhaps an extreme, but valuable example, is shown by a company that develops psychometric tests for the workplace. In recruiting new graduates, it puts them through a number of tests that meet both the culture and desired behaviours that the company seeks. In some cases, the HR group has been disappointed initially that a few, apparently strong, candidates fall through the net by failing tests, but over time the process has been validated. A young graduate employee, newly hired, expressed her astonishment on the interview process: “I expected to be grilled at interview, but they said that as they had such faith in their testing process, that those that came through were almost guaranteed a job. The interview was a final confirmation meeting.” The company has an excellent reputation for retaining its young employees. The opening up of recruitment to so many electronic platforms has allowed more candidates to access potential jobs resulting in higher numbers of applications per vacancy than in the past. It is therefore vital to make sure that intelligent sifting mechanisms are used to select candidates, from the first cut to the final shortlist. It is also important, for a generation demoralised by nonresponse from recruitment agencies and employers, to keep all candidates informed of progress of their application and provide feedback where possible. At work Gen Y desires constant feedback and appreciates all opportunities for mentoring. By communicating with every applicant, new employees will benefit from being helped through the process, and those who were rejected with have a positive image of the organisation with potential to become free advocates in the future. Quality recruitment data management, tracking and communication will enhance the reputation of the company far beyond an individual recruitment campaign. Research also shows that there is an increasing trend to ‘try before you buy’, exploiting various ways of bringing in people who fit well into the culture. 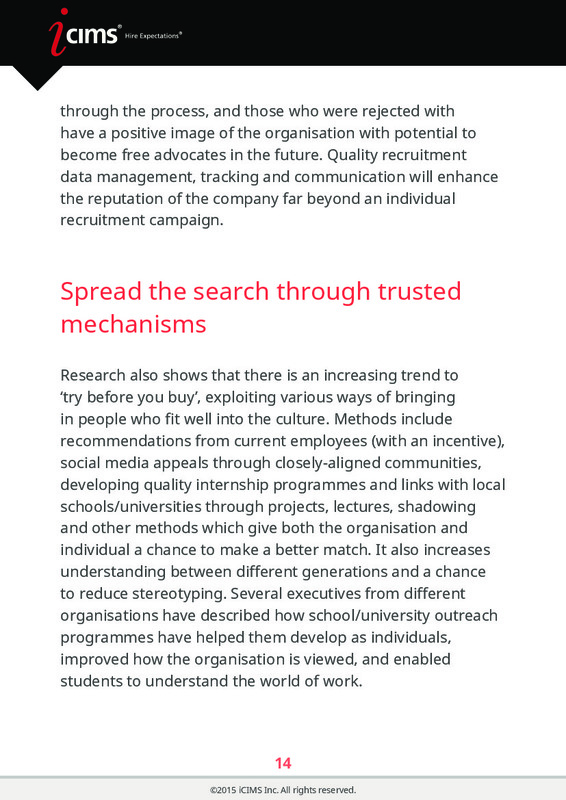 Methods include recommendations from current employees (with an incentive), social media appeals through closely-aligned communities, developing quality internship programmes and links with local schools/universities through projects, lectures, shadowing and other methods which give both the organisation and individual a chance to make a better match. It also increases understanding between different generations and a chance to reduce stereotyping. Several executives from different organisations have described how school/university outreach programmes have helped them develop as individuals, improved how the organisation is viewed, and enabled students to understand the world of work. Gen Y does have massive advantages in knowledge about modern communication, global networking, crowdsourcing, peer-level influencing and enthusiasm for publicity and good causes. These facets need to be exploited during recruitment. 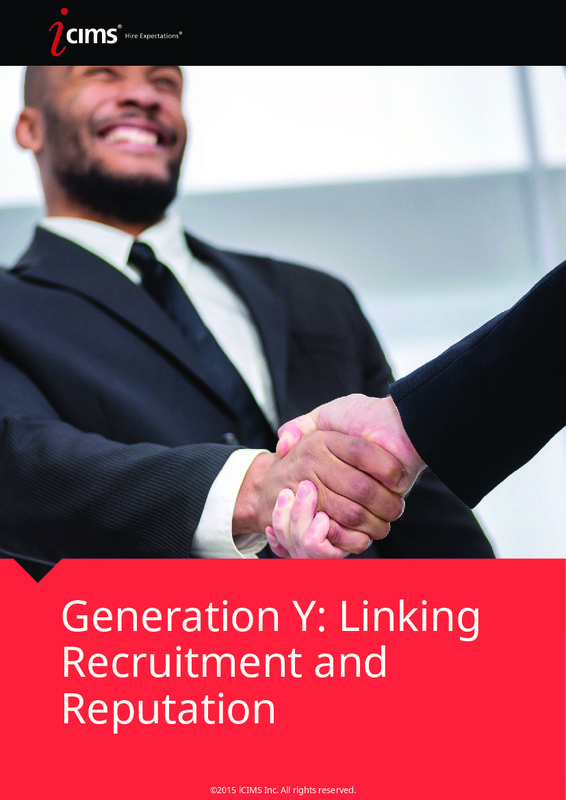 At the same time as the emergence of Gen Y, the methods of recruitment have also changed; it is largely an electronic process and interacts with a wider audience. It is not just about recruiting the right candidate; it concerns reputation. Tracking, communicating, evaluating and coordinating both people and media need to be electronic and to be based on a solid and reliable design. 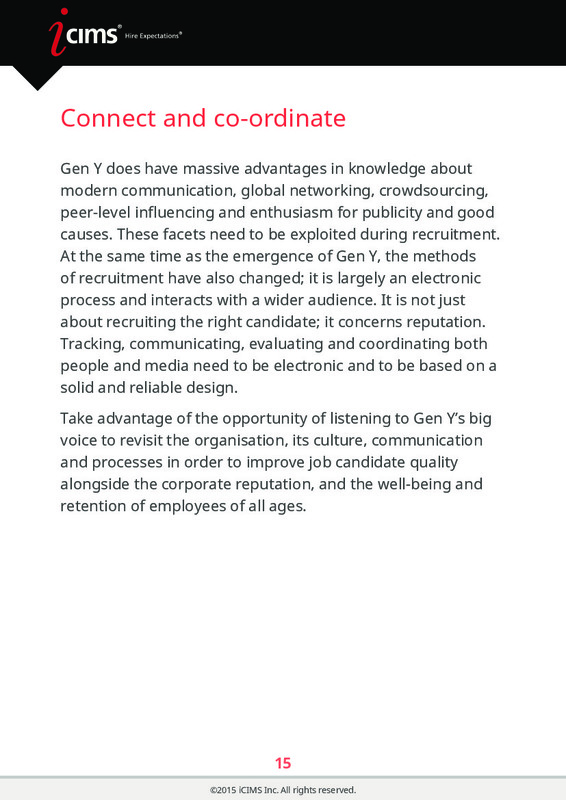 Take advantage of the opportunity of listening to Gen Y’s big voice to revisit the organisation, its culture, communication and processes in order to improve job candidate quality alongside the corporate reputation, and the well-being and retention of employees of all ages. Sue Honoré is an independent research consultant. She has held international managerial, strategy and consultancy roles in companies as varied as Peugeot, Intel and small independent businesses. Her specialities are in human behaviour, adult learning, and for the last 8 years, the intergenerational workplace. At Ashridge she acted as an internal learning consultant for six years, but is now an associate focused on research, in particular young people (Generation Y) and their managers at work. This intergenerational research now extends globally and encompasses social, cultural, gender and economic influences on workplace behaviour. Her other research topics include human interaction in a virtual MBA programme, innovation in executive education, and Return on Investment in customer service. Sue has taught for the CIPD and judged e-learning and editorial awards. 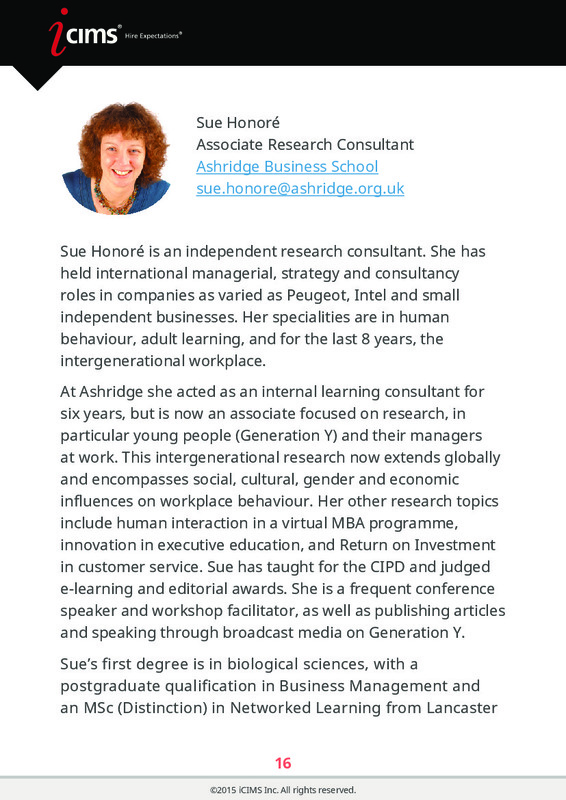 She is a frequent conference speaker and workshop facilitator, as well as publishing articles and speaking through broadcast media on Generation Y.
Sue’s first degree is in biological sciences, with a postgraduate qualification in Business Management and an MSc (Distinction) in Networked Learning from Lancaster University. In her continued aim to be a polymath, she now has an Advanced Diploma in Local History from the University of Oxford.